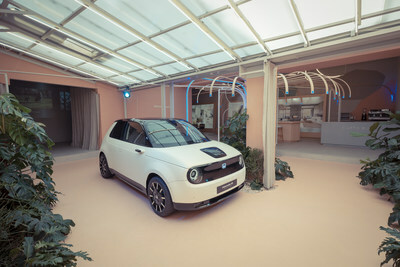 MILAN, April 9, 2019 /PRNewswire/ -- Honda opened the doors on its exhibit at Milan Design Week 2019, the first time the brand has had a significant presence at the world's largest design exhibition. Honda's e Prototype, fresh from its world premiere at 2019 Geneva Motor Show will be the centrepiece of the "Honda Experience - Casa Connessa Tortona". "Honda Experience - Casa Connessa Tortona"
Based in the Tortona design district of Milan, Honda has used high-end fashion boutique "Alysi - The Garden House" as the base to create its experience. The environment is completed by a diorama designed to represent the 'seamless living' style of the Honda e Prototype interior. Italian furniture company Danord curated pieces for this area. Based close to Modena, founder Francesca Gatti specialises in the curation of furniture in the style of mid-century Scandinavian and modern design alike. "Honda Experience - Casa Connessa Tortona" is based in zona Tortona, close to Porta Genova train station. The venue will be open from 9-14 April, 10am-9pm. A special media preview session will take place from 2.30-4.30pm on 9 April, where Honda designers and collaborators will be available for interview.